The iPad Pro is, at first glance, completely crazy. A giant iPad with all the limitations of iOS, coupled with added bulk that makes it harder to tote, and a price tag that starts at Rs. 70,000, all make it a hard sell. That's only the starting price though, and you're going to end up paying a lot more for this tablet. 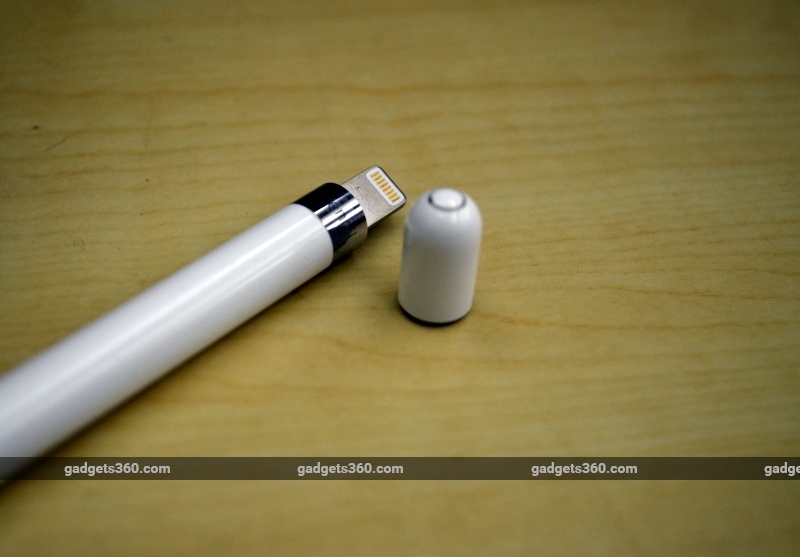 Realistically, you should get the 128GB model, which costs Rs. 79,900, and also the Apple Smart Keyboard, which will set you back by Rs. 14,900. 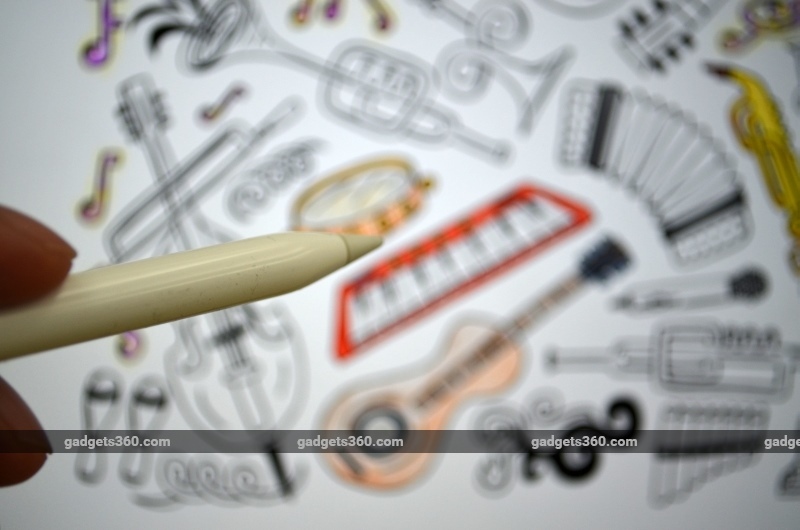 Artists, designers, and others might also need to buy the Apple Pencil, priced at Rs. 8,600 - which means a final price tag between Rs. 94,800 and Rs. 1,03,400. 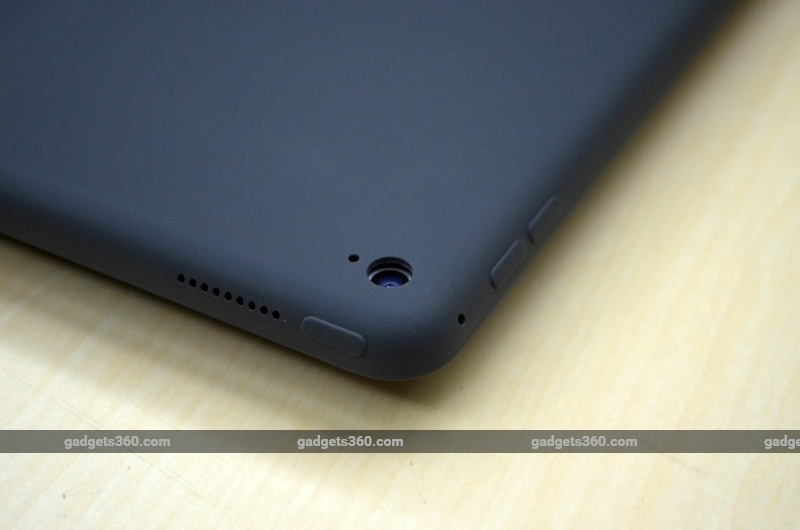 At that price, you can't really compare it to the iPad Air 2, the last 10-inch model to be released, with an MRP of Rs. 49,900 for the 128GB variant. But if the iPad Pro is nearly twice the price of the iPad Air 2, then it's also giving you a lot more, aside from being nearly as big as two iPad Air 2 units held side by side. More importantly, the added size and some very useful peripherals make the iPad Pro a real game changer. These, coupled with smart software tweaks that help with multitasking, make this feel like the first iPad which could be the only large screen device you need in your life. That's reflected in the specifications of the iPad Pro - this tablet is a powerhouse that powers a stunning 2732x2048 pixel 12.9-inch "Retina" display with the 64-bit "desktop class" A9X chip, which Apple says delivers twice the CPU and twice the graphics performance of the A8X inside the iPad Air 2. Does all of this add up to a machine that is also worth twice the price of the iPad Air 2? Can the iPad Pro really replace all your large screened devices? We answer these questions in our review. A lot of people laughed at the iPad and joked that it was just a bigger iPhone. A lot of the same people are probably pointing at the iPad Pro right now, and saying that it's just a bigger iPad. And yes, this is true - the basic design retains the same elements, and you'll find familiar buttons and ports in all the expected locations. Held in portrait mode, the iPad Pro feels a little too big - the 12.9-inch screen maintains the same 4:3 aspect ratio of earlier models, but the relatively thick top and bottom bezels make it feel a little too tall particularly when you're trying to hold it one handed to, say, type a quick response to a mail. It measures 12x8.68-inches - to put that in perspective, an A4 page is marginally smaller. With a thickness of 0.27-inches, or 6.9mm, the iPad Pro weighs in at a hefty 723g for the WiFi + Cellular model we tested, and although that's not too uncomfortable to carry around, it doesn't feel like something we'd be holding up as often as we do with our 4th gen iPad. For comparison, the iPad Air 2 weighs nearly half at much at 437g, but compared to the 13-inch MacBook Air - which sports similar dimensions and weighs 1.34 kg - the iPad Pro is extremely light. In portrait mode, with the home button at the bottom part of the device, you'll find the power button and 3.5mm port on the top side, and the volume buttons and microphone on the right side. The Lightning port is at the bottom, and there are speaker vents for speakers - two each on the top and the bottom. What's new is the smart connector on the left side of the iPad Pro - this is a new connector that the iPad uses for connecting to - and powering - smart devices such as the Apple Smart Keyboard. 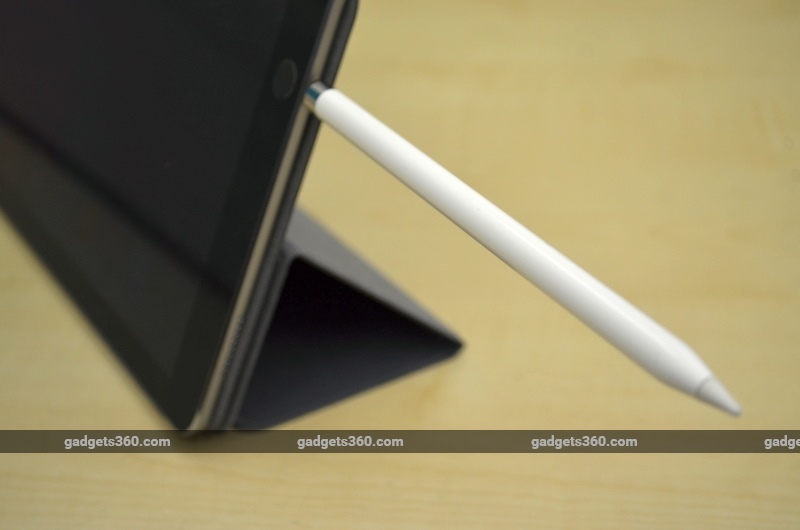 Whether you're holding it or merely looking at it, the iPad Pro is also very clearly a premium device and the star of the tablet is clearly the 2732x2048 pixel 12.9-inch retina display. This is, beyond a doubt, one of the nicest tablet displays we have ever seen. The iPad Pro shines in a number of different ways, but nothing highlights the joy of the tablet more than reading digital comics on it - the iPads are great for reading books but always felt just a little small when reading comics. In portrait mode, the iPad Pro is the perfect device for reading a comic or a magazine, and we flipped through Superman: Red Son again and again, just marvelling at the display. Although the Smart Keyboard and the Pencil are sold separately, Apple loaned us these accessories to use as well, so as to have the full "Pro" experience. 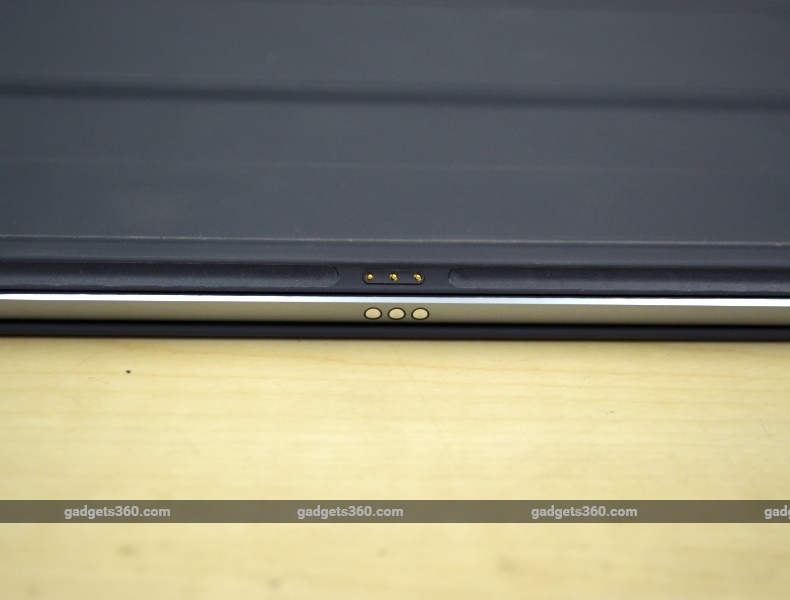 The keyboard looks a lot like a regular Smart Cover, but with an extra layer folded over. It's really thin, but while Apple doesn't list its weight anywhere on its website, the kitchen scale puts it at 340g. That's a fairly heavy attachment, and pushes the combined weight of the iPad Pro and the Smart Keyboard to over 1kg. 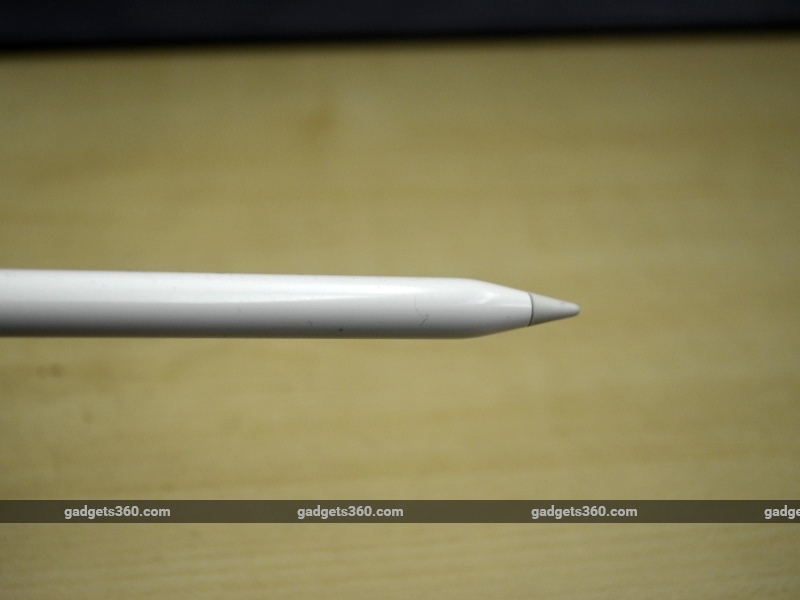 As for the Pencil, it's a fairly ordinary looking design, with a smooth, white finish and a rounded cap at the back, which removes to reveal a Lightning jack that can be connected to your iPad Pro to charge the stylus. The Pencil is a little skinny and we were worried about how comfortable it would be to use for extended periods, but actually it's fairly comfortable for most tasks. The only downside is that there is no place to stow it or otherwise attach it to the iPad Pro, which means that losing it is a real risk. The cap of the Pencil would be even easier to lose, and worst still, when it's charging, it sticks straight out from the iPad Pro, which frankly led to some worrying bumps while working - the good news is that it charges quickly, and a 15-second charge can give you a full half hour of usage. 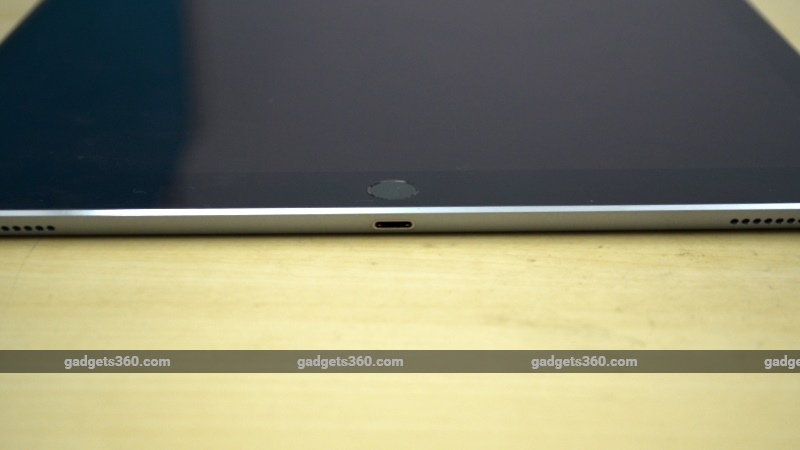 The iPad Pro has a 2732x2048 pixel 12.9-inch retina display, and is powered by an A9X chip with 64-bit architecture. It also has an M9 motion co-processor, and 4GB of RAM. 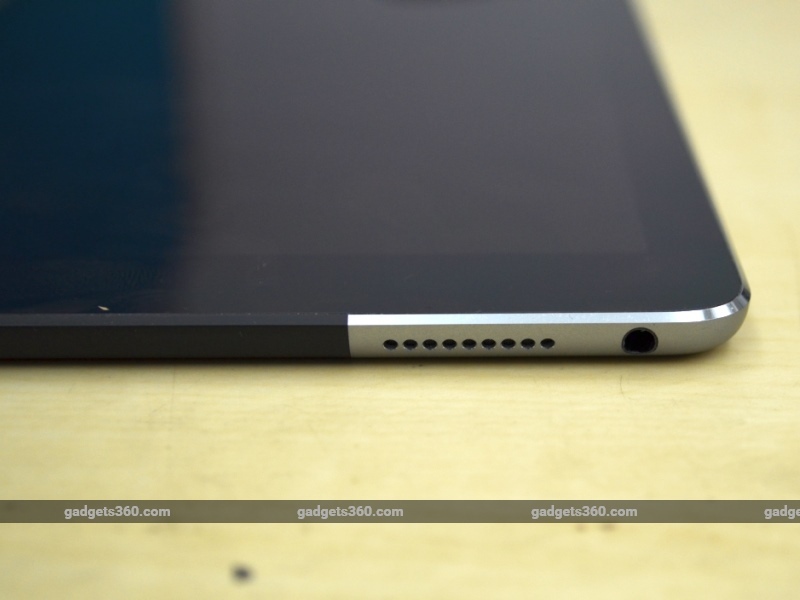 There's an 8-megapixel camera on the rear, and a 1.2-megapixel front camera for video calls. The home button also includes the Touch ID sensor which you can use to log into the device, or to pay for apps in the App Store. The iPad Pro has a built in 38.5-watt-hour rechargeable battery. Using the iPad Pro on iOS 9.2, the whole experience was by and large familiar. 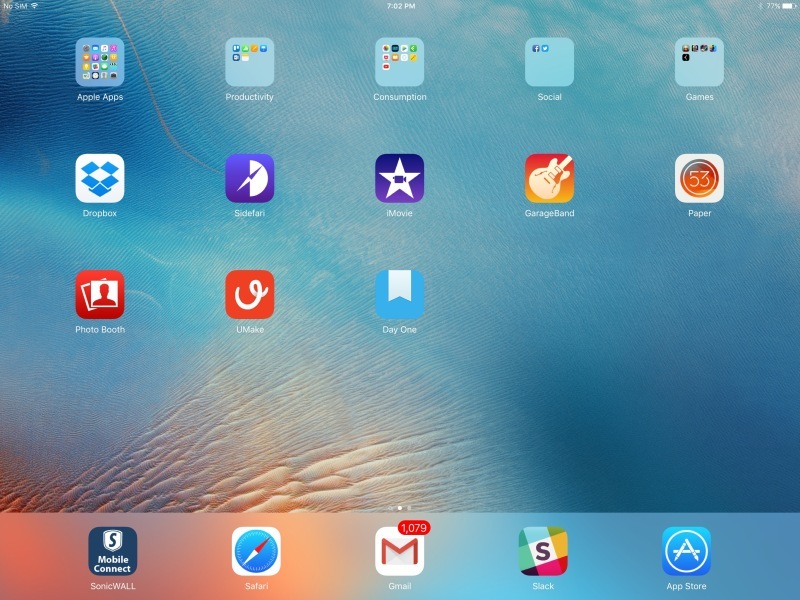 The basics, from the home screen layout to the long press and gestures that we're familiar with are all there in the iPad Pro, and if you've ever used an iPhone or iPad before, then you're going to feel right at home. The iPad Pro does not use 3D Touch but it does have a couple of multitasking features other iOS users might not be familiar with. 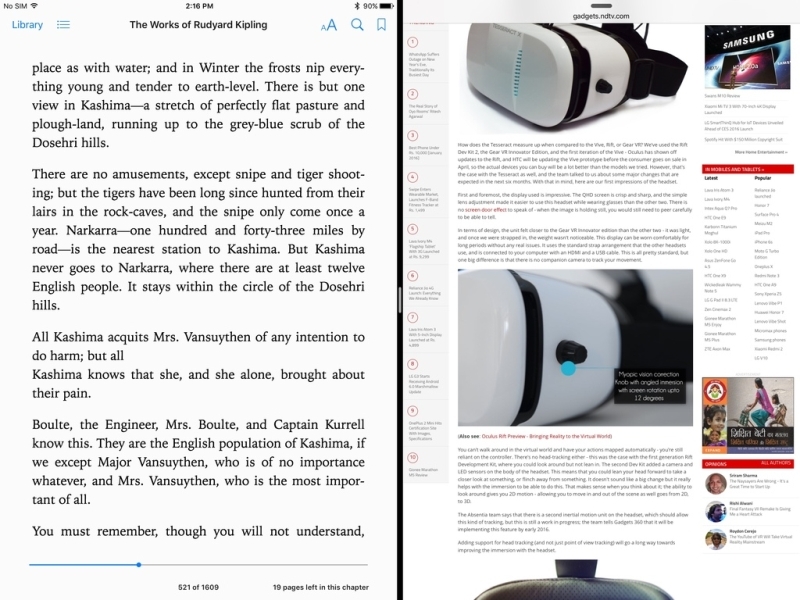 Split-view and picture-in-picture are available on the iPad Air 2, the iPad Mini 4, and the iPad Pro. Picture-in-picture allows you to pop out a video and watch it even while you're doing some other work - this also works with FaceTime - and this is triggered automatically by pressing the Home button when you're watching a video in a supported app. The official YouTube app does not support this feature, but you can get third-party clients that have been updated with this functionality. Split-view allows you to run two apps side by side on the iPad - this is particularly handy in landscape mode, where you could have Slack running on one side, to coordinate with the rest of your team, while you've got Word or Safari open on the other side to keep doing your own work. The iPad Pro also has a very useful multitasking feature called Slide Over - here, you just pull the screen in from the left, and you get a small view of the last opened app. You can change the app by swiping in from the top of the screen. This is really handy if you're doing something on the side which doesn't need to be open all the time. So for example, if you're writing something and want a Safari window open on the side for your research, Split-view is useful. But if you're writing something and want to quickly respond to a tweet and get back to work, Slide Over is great as it quickly shifts the focus without switching completely away from your main window. There are some quirks with this system though. For example, if you're working on an article in Word, and want to open a second .doc file to reference some material, you can't easily do this. The workaround is to use Pages and Microsoft Word at the same time, so you use one to do your work, and the other to open the second file. Similarly, if you want to view two browser windows side by side - perhaps to check a document or to keep a checklist open on the side - then you can't run Safari twice. We ended up downloading an app called Sidefari as a workaround. The layout of the home screen is also something that is getting patently ridiculous. The iPad Pro is huge, even when held in Portrait mode - that means that the individual app icons sit far from each other, and the amount of space that gets wasted on the iPad Pro's home screen is really annoying. Equally bothersome is the default on-screen keyboard - the keys are just too widely spaced to use comfortably one handed. To comfortably type on the iPad, you need to set it down and work with both hands. But if you're doing that, then why not use the Smart Keyboard? An option to make a smaller keyboard for one-handed use - something that is available in other iPad models as 'Split Keyboard' under Settings - would have been great, so that you can use the iPad for reading and quickly reply to a text without resorting to hunting and pecking. There seems to be a workaround of sorts available, but that's far from an ideal solution. Also, the row of numbers above the alphabets on the keyboard appears to be half the size of regular keys. If Apple had just made the other four rows marginally shorter, the number keys could have been regular sized without taking up more of the screen, and they would have been significantly more useful. But perhaps worst of all is that not many apps are properly optimised for the iPad Pro as of now. Some of the apps are using their own keyboards which look even stupider on an iPad Pro, and if you try and run an app such as Zomato, which has not even been optimised for an iPad and runs in what's commonly called the 2x mode - well, you can get away with it on an iPad, but on the iPad Pro the experience is just disastrous. That's not Apple's fault, of course, as developers have to update their apps. However, until that happens, using some apps on the iPad Pro can be difficult. But beyond that, the iPad Pro will also require developers to rethink how they design apps for the iPad. For example, both Facebook and Twitter don't make good use of the space of the tablet. In Slide Over or even Split View, these apps work fine, but in full screen mode, they feel quite ridiculous, much like the gaps between icons on the home screen. These are all problems that can be fixed over time with software updates, and it's important to note that Apple got the big issue - of multitasking - right. Working on the iPad Pro feels natural, and we've been using it for office work, switching between different applications, and getting things done with a lot less difficulty than we had imagined. Still, some of the things we've pointed out are fairly in your face, and could have easily been tweaked before the launch of the device. Whatever quirks you might find in iOS, there's no denying that the iPad Pro is a super-powered machine that can handle just about everything we tried to do. 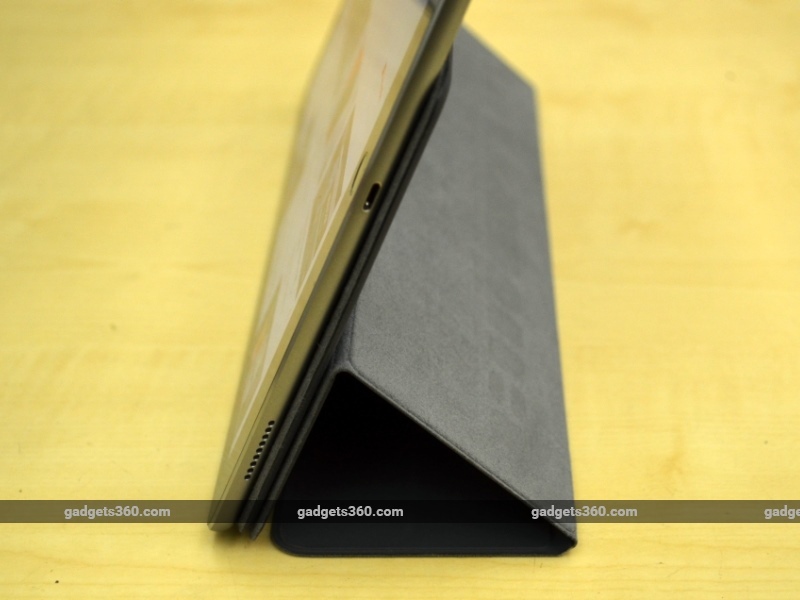 In terms of benchmarks, it is definitely a lot more powerful than the iPad Air 2. The GFXbench T-Rex on screen score was 59.4, while the iPad Air 2 was at 52.3 according to our review. 3D Mark Ice Storm and Ice Storm extreme were both maxed out, while the Ice Storm Ultimate score was 33,622, compared to 21,576 on the iPad Air 2. Sunspider and Mozilla Kraken were incredibly fast, at 196.6 and 1620.4 for the iPad Pro compared to 286.3 and 4060 for the iPad Air 2 review results (lower is better for these tests). Browsermark did not run on the iPad Pro, but the iPad Pro also had an excellent Geekbench 3 score of 5526, and Tabletmark v3 of 1401. Perhaps more important than the numbers though, is the day to day performance of the iPad Pro, and this is where tablet really shines. 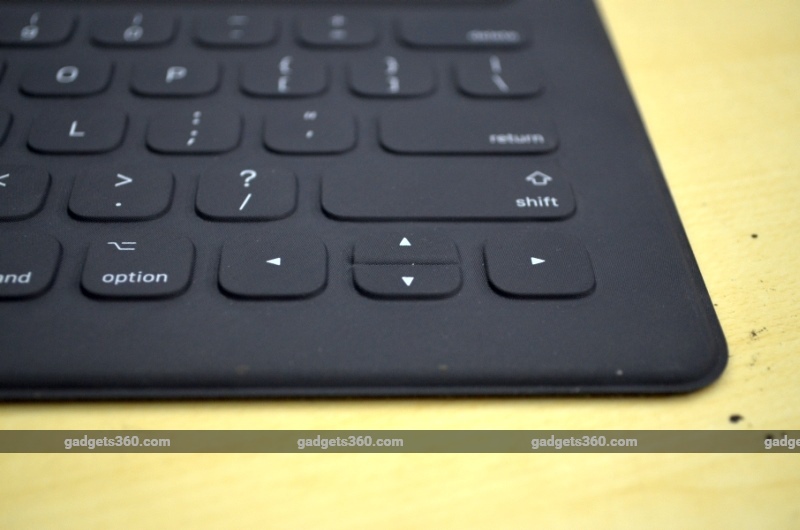 If you're getting the iPad Pro along with the Smart Keyboard - and you should - then you're spending over Rs. 90,000. This means that you are probably looking to replace all the large screen devices (including laptop) you use - and for the most part, we found the iPad Pro to be capable of doing just that. Launching apps was delightful; yes, this is a brand new iPad Pro which doesn't have a year's worth of junk accumulated as yet, so it's not really representative of the final experience, but having every app we touch jump to life with alacrity was such fun. Quick switching between visually intense games such as Bastion and XCOM: Enemy Within occurred instantaneously, without any noticeable lag or stutter. We were able to play through a level of XCOM, using Slide Over intermittently to carry out a conversation with a friend over Twitter, without any issues at all. That said, at the time, these games have not been optimised for the iPad Pro, and the visuals looks jagged and blurry. Gameplay is ridiculously smooth though, and blows away the experience we've had with earlier iPads. Games like Blek, which has been optimised for the iPad Pro, show just how amazing that giant display is, and really shine on the tablet. Aside from gaming, we tried out a lot of things that would typically be more desktop level tasks. Tweaking images using Adobe Photoshop Fix was smooth and worked out really well, and quick resizing was done best using Image Size. Paper by FiftyThree remains one of our favourite drawing apps, and it is an excellent showcase of the Apple Pencil as well. The default Notes app also allows you to make detailed sketches and drawings, and has improved significantly over the years. Umake is a powerful 3D design tool that allows you to sketch out your ideas. We could play with some incredibly detailed designs, though our best effort was making a Helium atom. It turns out that sketching in 3D is a little difficult if you don't know what you're doing. 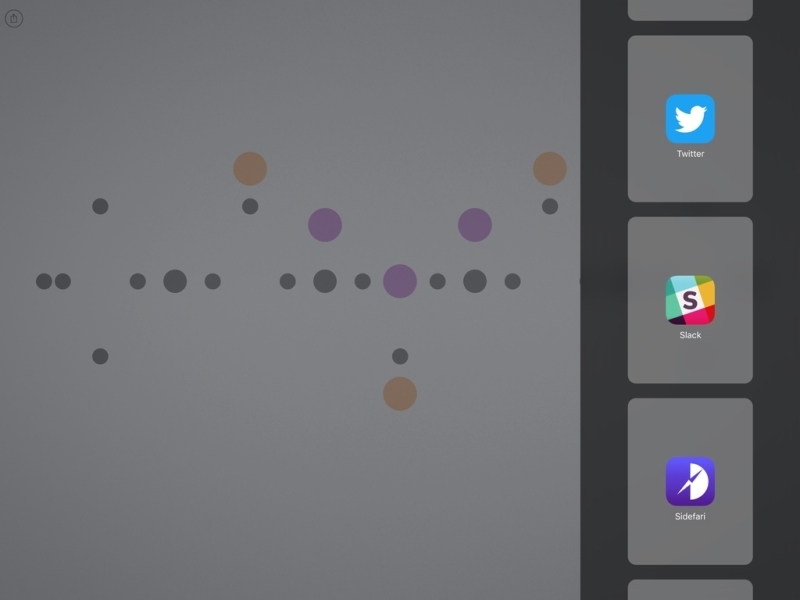 Slack, MS Office, Safari, and Trello were our go-to apps for day-to-day work, and all performed admirably. The iPad Pro wasn't just used for one or two stories to prove that it can be used for work - it replaced our work laptop for use 90 percent of the time. The only exception was for when you wanted to work late at night from bed - the Smart Keyboard is amazing on a desk, but kept on your lap, you can't angle the screen the way you want, there's a genuine risk of the whole thing falling over, and even if it doesn't the keys don't feel solid enough to type comfortably. Despite this caveat, in our view, the iPad Pro, along with the smart keyboard, proved to be handy enough to actually replace the laptop we use for work. The first couple of days were a little tricky - figuring out the apps to resize images easily, and sorting out workflows to compensate for the new device certainly took a little time. But frankly, that's no different from when you pick up a new laptop for the first time, and have to sort out all the software you need to get it up and running to your needs, especially when, say, you are switching from Windows to OS X, or any other new platform. But perhaps the very best thing - in terms of performance - about the iPad Pro is actually the four speaker setup that Apple has fitted into its sleek body. 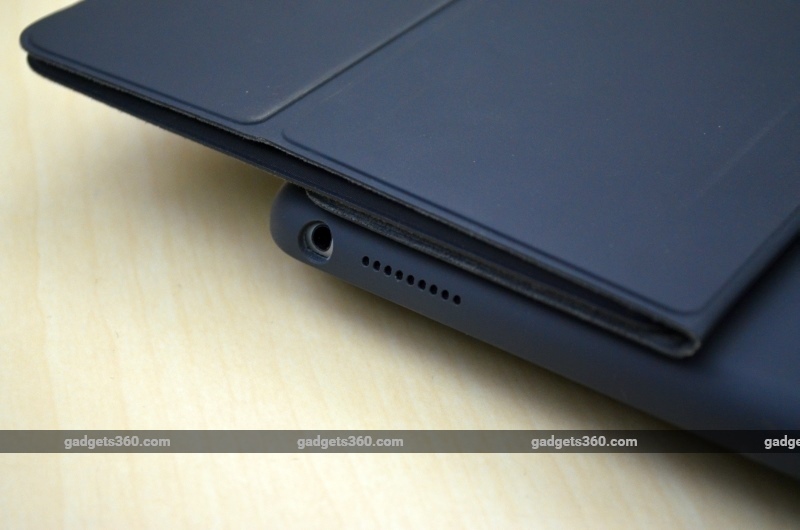 Tablets and laptops both tend to have terrible, tiny speakers. The iPad Pro can't have particularly huge speakers either, but Apple has done an excellent job in getting the four of them to work together and they sound amazing. Frankly, everyone talks about the iPad Pro as a professional productivity device, but most of us use our tablets and laptops for a mix of work and entertainment, and the iPad Pro is a real star on the entertainment side of things. It's got the power to run any game you want, and play your movies and music at the highest quality. It's also got a screen that really does justice to your content, and speakers that make everything sound great. The iPad Pro sends the mids and high notes to the upper speakers, and the bass to the lower speakers, to keep the sound clean and maintain separation - this doesn't mean that you have to hold it in a particular way though; it detects the orientation, and changes the "layout" of the speakers accordingly - the actual speakers are the same, but by allowing them to focus on different parts of the audio, Apple accomplishes something truly amazing. The result is an iPad whose speakers sound rich, clear, and loud, and can go head to head with almost all the mobile devices out there. 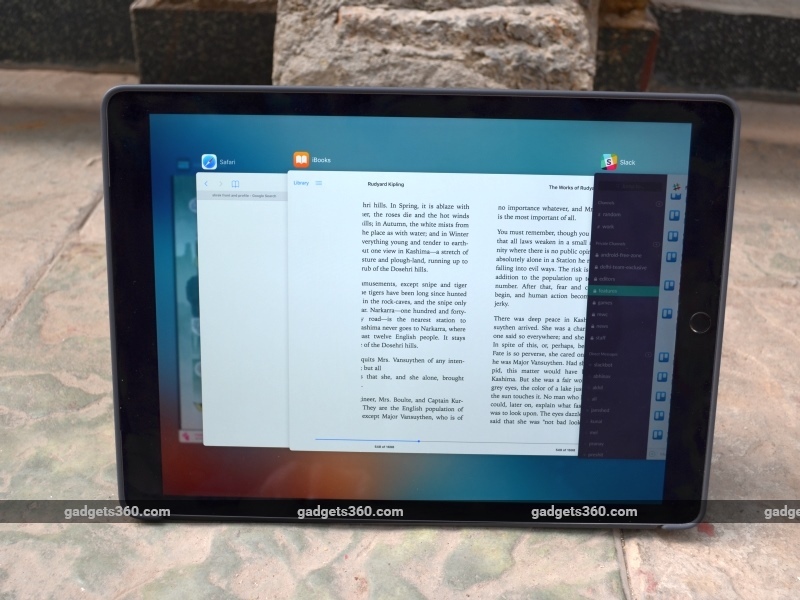 It's also the first iPad whose screen is big enough, and whose speakers are good enough, that two people can actually comfortably watch a video together, which is great for when you want to do a session of funny YouTube videos before calling it a night. As mentioned, the iPad Pro - like most other tablets these days - comes with front and rear cameras. There is an 8-megapixel camera on the back, which is reliable and works quickly, but the huge size of the tablet itself makes it inconvenient to use. However, we wouldn't recommend that you use your iPad Air as a camera either, so that's easily settled. The front camera is the standard FaceTime camera setup, and works perfectly well for that role. That sums up the iPad Pro, but when talking about it, we also have to consider two accessories, the Apple Smart Keyboard, and the Apple Pencil. The Pencil works wirelessly, and charging it is a design nightmare, as the six inch Pencil sticks right out of the side of the iPad. Charging it in a crowded office or café is a nightmare. There's also no place to stow or attach the Pencil, so you're going to be forever terrified of losing it. Worse yet, the cap on the back can't be stowed anywhere either, so the whole Pencil experience is one where you're regularly looking for it. On the other hand, actually using it is a delight. 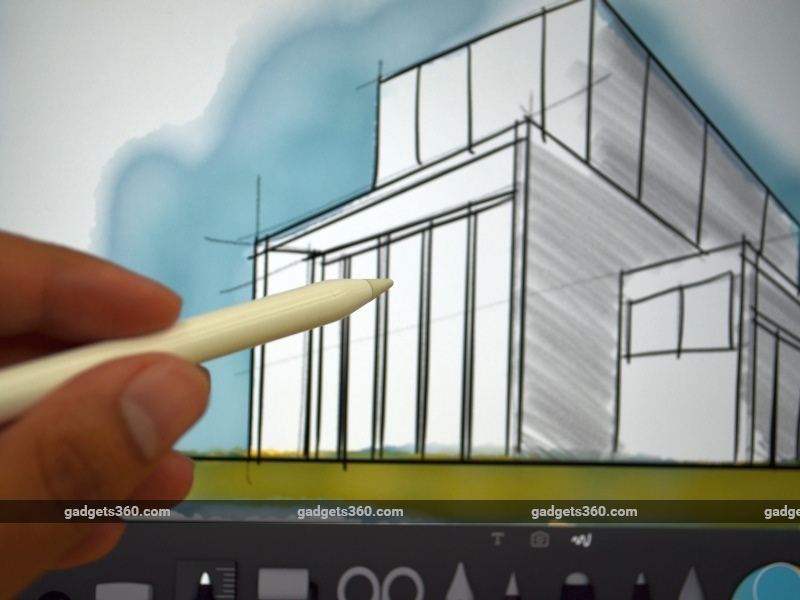 Drawing in Paper by Fifty Three is incredibly smooth, the app inks fluidly and responds well to the slightest changes in pressure when you are drawing. Switching between different drawing tools in the app, we could see how effective the Pencil really was - drawing light lines with the pencil and then detailing in with the pens worked perfectly, and although we're not artists, we kept wanting to draw more with the Pencil. Paper is a wonderful app that can inspire anyone, but the experience of using the Pencil was significantly better than what we've seen with our fingers, or other styli. The palm rejection works really well too, and except for one or two occasions, we never had any problems with the iPad mistaking our hand for the Pencil. The only (minor) issue we had with the Pencil is that there's no display on the body of the device to show you its battery level. It's not really a problem, because you can see the battery level when it's connected to the iPad, and you can get a good amount of work done with just a 15-second charge. However, while it is a really fine stylus, at the end of the day, the question is whether you need a stylus that costs close to Rs. 10,000. For most of us, the answer is probably no. If you're an artist or a designer, or someone like that, then you could definitely consider the iPad Pro. The apps are there, and so is the hardware, so you could replace a lot of different gadgets with just one. For typical office workers like us, the Pencil is an unnecessary flourish that is very cool, but not necessary. The Smart Keyboard on the other hand, is a very different thing, and is, in our opinion, a very necessary accessory. 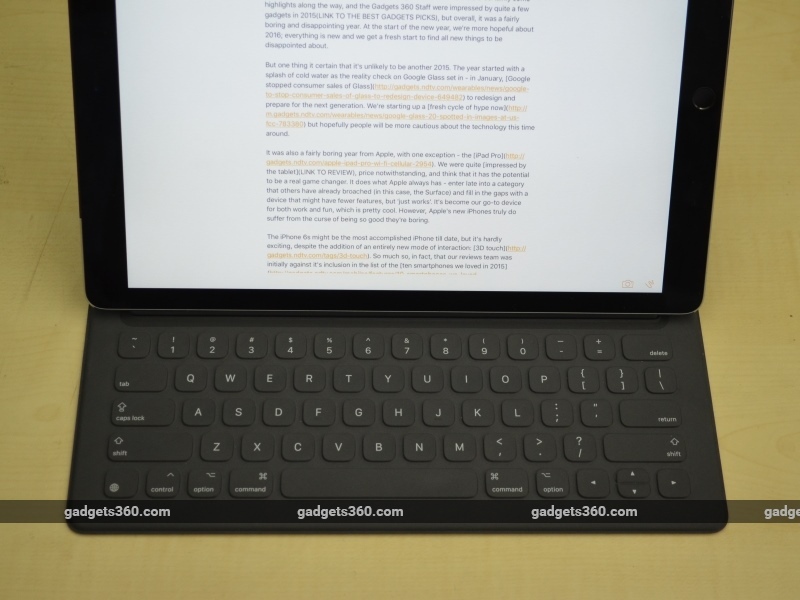 There are plenty of Bluetooth keyboards you could use instead - if you own an iMac you could use that keyboard; and if you've previously bought a Bluetooth keyboard for an older iPad, that could be paired with the iPad Pro instead. However, the result would be a very compromised experience when compared to the Smart Keyboard. It's not the perfect keyboard - let's get that out of the way quickly - the keys are ever so slightly irregularly spaced compared to "normal" laptop keyboards, and the layout kept throwing us off at first. The keyboard also lacks special keys to get you to the do something like adjusting the volume, or skipping tracks in the media player. And the decision to have the world's tiniest up and down arrow keys is frustrating and something we weren't able to use properly without looking. Another thing about the Smart Keyboard is that it's incredibly thin - which means that the keys have no travel. You can press them and they do go in slightly, but in comparison, even the terrible keyboards on our laptops feel springy and comfortable. As a result, our typing speed also went down significantly, though we were able to compensate for it in a week or so. On the other hand, did we mention that it's so thin that you won't even remember it's there half the time? Although the Smart Keyboard adds 300g to the weight of the iPad, that's significantly less than any third-party keyboards we've used with our older iPads. What's more, it's spill-proof, which is a definite plus. Since it doubles as a screen cover, that's one less thing to carry in our bag as well; and although the added weight isn't insignificant, it's well balanced and won't be an issue for the most part, unless you're used to holding up the iPad and reading on the go or while sitting without a desk. Perhaps the best part of the Smart Keyboard is that it doesn't require any charging. 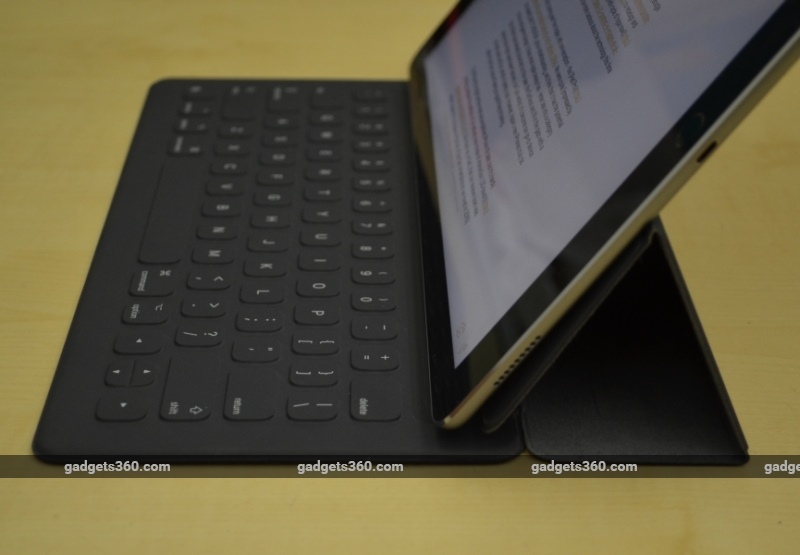 Unlike a Bluetooth keyboard, which needs to be paired and powered, the Apple's keyboard connects to the iPad Pro and draws power from the Smart Connector, which means that it is always ready to go when you want, and snaps on and works instantly. The magnets holding it in place are also pretty firm, and despite worrying about it, we've luckily not faced any problems when grabbing the Air by the keyboard end, letting the tablet dangle over through carelessness. And at the same time, you can relax, flip the keyboard around and change the cover to the stand mode, and watch videos if you want to, the way you can with the Smart Cover. Setting up the iPad Pro on a table, adjusting the cover to the right angle, and typing away is incredible and allows you to get a lot of work done without any issues. We were able to log into our VPN, connect to the CMS, and file stories and upload images while on the go. It's a lot more convenient than the bulky Windows laptop we normally have to lug around, and opens up a lot of possibilities when working on the move. One thing we've liked about our older iPads has been the battery life of the tablet. It's not something that most people will end up charging on a daily basis. The iPad Pro is however powering a much more powerful system, with a huge, high resolution screen and four speakers compared to two. So how does that measure up on battery usage? Our standard video loop test saw the iPad run for nearly ten hours (9 hrs 40 mins). That's impressive, even for day to day use it works out pretty well. When we were using the iPad Pro for work, it needed to be charged every day. We would start at full power in the mornings, and then sit down and work for around 10 hours - that wasn't non-stop, and there were breaks for calls and interviews, and of course, lunch. For work, the iPad Pro was mostly used for browsing, lots of typing, and apps like Slack and Trello which we use to coordinate our stories. After a day of work, you need to charge your iPad Pro again, which is pretty reasonable if not particularly groundbreaking for iPads. A little extra battery power would have perhaps been worth the trade-off for a slightly heavier device, but we all know Apple's preferences on that subject. Does that mean that you should be picking up an iPad Pro right now? Probably - if it wasn't so painfully expensive. The 32GB model is cheaper, but if you're thinking of editing high resolution images or saving videos to the tablet, or loading up a few good games or your music collection, then you're going to run out of space in no time. So you're going to have to spring for the more expensive model. We don't think that you need the cellular model - we never go anywhere without our phones, which can double up as a hotspot. That being said, having a SIM card in the tablet does give you more flexibility, and can be a better solution for some people who are on the go a lot. If you're mostly working from home or office though, then the Wi-Fi only model is good enough. And while it's possible to use the iPad Pro without any accessories, we'd recommend that you buy the Smart Keyboard as well. 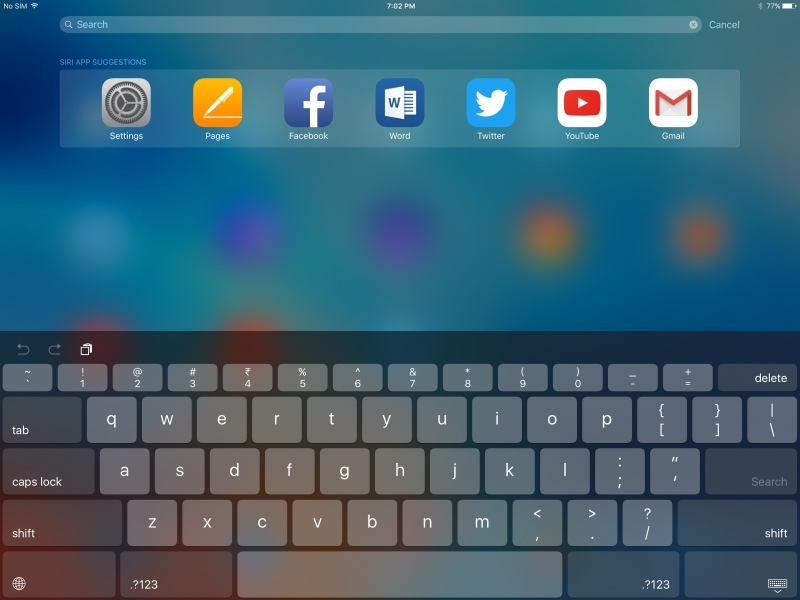 It adds a lot to the experience, and frankly, the on-screen keyboard on the iPad Pro leaves a lot to be desired. Plus, although this is a great machine for entertainment, putting in that extra money helps to make the jump from being an iPad to being a laptop replacement as well. So that means that you're spending around Rs. 95,000; more if you feel you also need the Pencil. 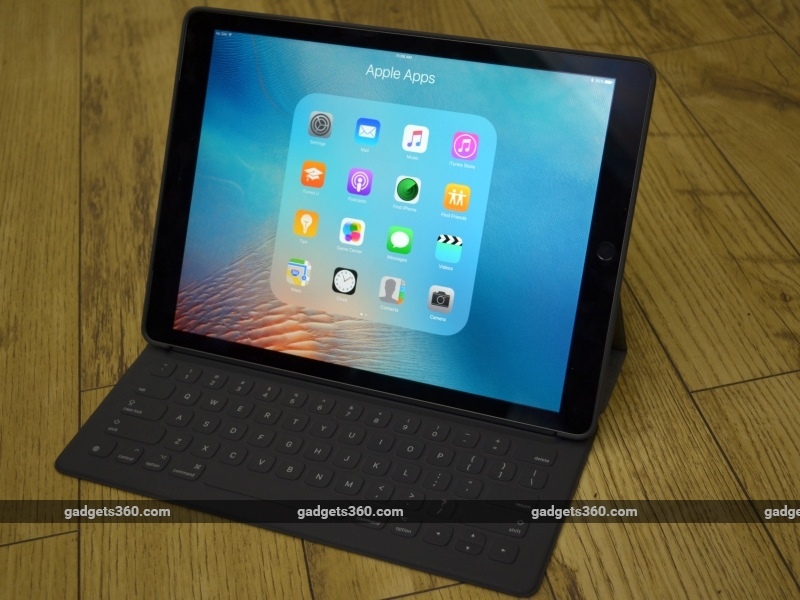 But with a few compromises, the iPad Pro can replace an iPad as well as a MacBook Air; combine the cost of both those two devices, and the iPad Pro seems like a great saving - at least that's what you should tell yourself if you choose to buy this tablet. It is, beyond a doubt, an excellent iPad. It's a little too big and bulky, but it's amazing how quickly you get used to that - just look at the phablet category for proof. Our iPad Air now feels poky, and videos seem disappointingly small on that screen. 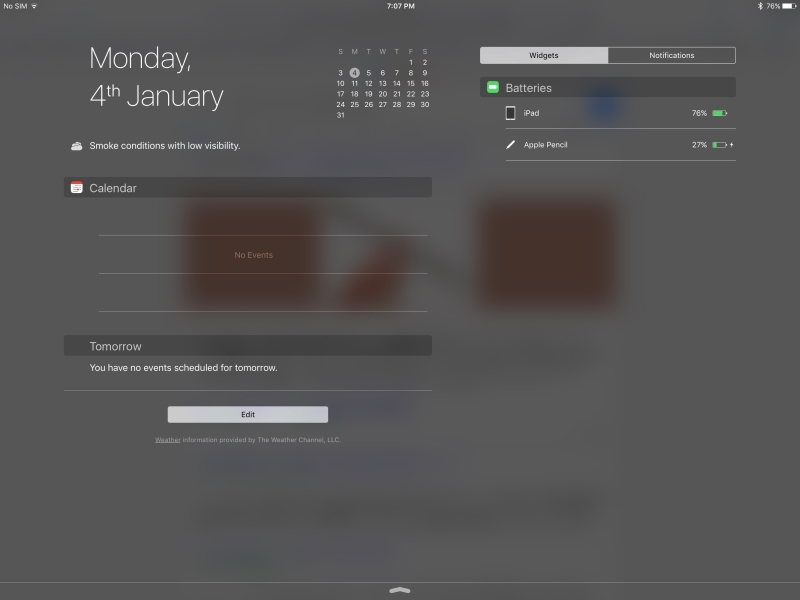 The multitasking features make it a lot more useful than any older iPad, particularly Slide Over, which allows you to quickly deal with distractions and then get back to the job at hand. Is it also an excellent computer? That's a trickier question to answer. For a certain generation, the answer is probably going to be no. There are some things that you just can't easily do with the iPad Pro, and people will miss their trackpads and their USB ports. There are different accessories you can buy to deal with this - Apple has a Lightning to USB camera adapter, while the likes of Strontium have USB drives that can connect to your iPad's Lightning port, though these are not without issues and they do come with an extra cost. For people who see computing as a mobile-first concept, the iPad Pro fills all the gaps. Between the iPad Pro and a smartphone, we found almost no reason to use a laptop except once or twice, in very specific situations like copying data from a pen drive. If you're accustomed to using your iPad more than your laptop anyway, then there's definitely a strong case to be made for the iPad Pro. That said, it's probably not good value for money to upgrade from an iPad Air 2 to an iPad Pro - the cost is really high. If you're due to update your laptop and your tablet though, then the iPad Pro could really be an ideal choice, as it replaces all your other large screen devices.